What a beautiful home in the heart of Bend. The location is walking distance to all the shops. And the brief walk is like walking through a storybook! 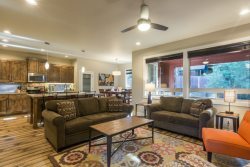 This home is perfect for families with kids. Its comfortable with all amenities you can imagine. I especially liked all the Bend visitor magazines and guides that were waiting for us. My buddys and I went to experience golfing and Bends brewerys. We had a great time in Bend as it has a lot to offer...The golfing was excellent, brewery were amazing and the house was more than expected! We stayed two nights and it was a nice relaxing setting with all the amenities. I would recommend Bluebird vacation rentals and the Awbrey house to anyone. We had 3 couples in our party and this house was perfect for us. The bedrooms are big and clean. We had some friends over for dinner and sat 12 people at the dining room table comfortably. The hot top was a great touch for relaxing after a day of hiking Broken Top Mountain. The house had everything we needed including dishes, cookware, towels, blankets. Our four night stay was great! Delivered exactly what was promised, a nicely renovated home in the middle of everything in Downtown Bend, truly walking distance. All fixtures, details, and appliances were in perfect condition, and everybody was very comfortable. This home exceeded all of our expectations. We were very comfortable and the kitchen was awesome. Great space to cook in. We were in Bend for a wedding and this house was the perfect central location. It was wonderful to be within walking distance of downtown. We had a great time.